The Best Miami blogs from thousands of top Miami blogs in our index using search and social metrics. Data will be refreshed once a week. Miami newsletter is a comprehensive summary of the day's most important blog posts and news articles from the best Miami websites on the web, and delivered to your email inbox each morning. To subscribe, simply provide us with your email address. Miami, FL About Blog Miami New Times is your guide to news, music, movies, culture, restaurants and events in Miami, Florida. Miami, FL About Blog Miami is a bilingual destination website that curates Miami and South Florida entertainment, delivering only the best things to do, places to go and people to see. A publication of the Miami Herald. Facebook fans 83,978. Twitter followers 91,509. Miami, FL About Blog Every aspect of living in Miami, for people who care about their city, their streets, and their homes. Facebook fans 17,835. Twitter followers 10,843. Miami, FL About Blog The Miami Restaurant, Bar, and Nightlife Blog. Food news and dining guides for Miami. Facebook fans 14,014. Twitter followers 26,662. Miami, Florida About Blog Miami’s top designer fashion blogger. Thewordygirl is a funny blog about serious fashion, luxe travel (Maldives, anyone?) and highbrow beauty. Facebook fans 24,641. Twitter followers 8,891. Miami, Florida About Blog Miami’s No.1 Art Blog – an influential art portal covering local, national and international art news and information. The Miami Art Scene™ platform is deeply immersed within the global visual arts community. Our audience spans the creative landscape including collectors, dealers, artists, galleries, museum directors, curators, designers, art aficionados and connoisseurs. Facebook fans 15,140. Twitter followers 9,861. About Blog Your best source for quality Miami-Florida Hurricanes news, rumors, analysis, stats and scores from the fan perspective. Facebook fans 47,841. Twitter followers 22,786. Facebook fans 43,453. Twitter followers 348. Miami, FL About Blog Read the latest local news, from Miami and the South Florida area, and around the country and world by Miami Herald. Miami About Blog A Miami Florida-based mommy sharing her adventures in cooking, parenting, reviews, travels, and entertainment. | Miami Blogger | Miami Mom Blogger. Facebook fans 11,417. Twitter followers 21,957. Miami, Fl About Blog Burger Beast writes a food blog about Comfort Food based out of Miami, Florida. He is also an Event Creator, Food Historian & the Burger Museum's Curator. Facebook fans 60,333. Twitter followers 18,941. New York, New York About Blog The Real Deal Magazine provides cutting edge news on the real estate market in Miami, South Florida, and beyond. Facebook fans 70,836. Twitter followers 56,905. Miami About Blog Welcome to CBS Miami's page where you'll find our latest news stories, interactive content and breaking news and traffic updates. Facebook fans 211,825. Twitter followers 78,110. About Blog This blog has been called "the definitive blog on miami criminal law" by the NY times, the washington post, the pope, and donald trump who also once said it was "really great". Miami About Blog Miami's Style and Beauty Expert "It" Girl is "The Fashion Poet." She covers Miami's fashion scene giving you style news, events, designers, beauty, boutiques and shopping must-haves. Facebook fans 7,939. Twitter followers 12,484. South Florida About Blog South Florida's top source for breaking news, weather and in-depth coverage of the Miami Dolphins, Miami Heat and other sports. Facebook fans 123,935. Twitter followers 235,876. Miami / Fort Lauderdale About Blog South Florida's news station, 7 News. The latest breaking news, headlines, weather and sports about Miami / Fort Lauderdale. Miami, FL About Blog Miami condos and homes for sale and rent in Miami and Miami Beach. Miami real estate listings with prices, photos and stats for Miami homes and condos. Facebook fans 9,020. Twitter followers 973. Miami, FL About Blog At Hot Hot Hoops, you will find the latest news on the Miami Heat. Complete game previews and recaps as well as special features written by our writers. Facebook fans 165,959. Twitter followers 9,979. Miami, FL About Blog The Miami Hurricane is an award-winning newspaper published by students at the University of Miami. Print issues of The Hurricane are available at stands in and around campus every Tuesday. Facebook fans 4,015. Twitter followers 7,902. Miami, FL About Blog Your local Miami guide to restaurants, food and drink, photography, arts, wine, bars, entertainment, and tips to enjoy the city. Facebook fans 6,053. Twitter followers 10,531. Miami, FL About Blog Pérez Art Museum Miami exists to improve the quality of life for individual residents of and visitors to Miami-Dade County, as well as social life in the communities they represent, by facilitating catalytic engagements with the most progressive visual arts of our time. Facebook fans 73,359. Twitter followers 30,354. About Blog The best of Miami, Everyday! Facebook fans n/a. Twitter followers 1,085. Florida About Blog Your best source for quality Miami Marlins news, rumors, analysis, stats and scores from the fan perspective. Facebook fans 2,865. Twitter followers 2,552. Miami About Blog The Rebel Chick - Miami Lifestyle Blogger is a website full of fun! You'll find the latest in food, travel, entertainment and technology. Facebook fans 8,266. Twitter followers 85,653. About Blog The ultimate home for Miami Marlins news, rumors, updates, trades, signings, injuries, commentary, analysis, and more! Facebook fans 473. Twitter followers 1,531. NYC About Blog Welcome to Fashionable Hostess a lifestyle blog dedicated to entertaining, home decor, fashion, family, and everything beautiful. Style your Wardrobe. Style your Home. Style your Baby. Facebook fans 6,180. Twitter followers 2,818. Miami, FL About Blog Re-identify Miami through engaging and locally-conscious storytelling, experiential events, and compelling content. Facebook fans 7,101. Twitter followers 1,066. About Blog A Miami Dolphin Blog...by fans, for fans. West Palm Beach About Blog I’m Stephanie, a twenty-something former ballerina turned PR pro living in a sub-tropical paradise in South Florida. Follow me as I spill my secrets on what to buy, where to get it and what's in season. Facebook fans 4,743. Twitter followers 934. Miami, Florida About Blog INDULGE is the luxury magazine of South Florida, published seven times a year by the Miami Herald. The award-winning magazine showcases South Florida luxury at its finest, including the people and brands influencing our everyday lives. Facebook fans 13,454. Twitter followers 3,432. Miami Beach FL About Blog Miami Beach Realtor Nancy Batchelor specializes in Miami Beach real estate - including luxury homes and condos, waterfront properties and exclusive rentals. Facebook fans 1,695. Twitter followers 1,596. Miami, Florida About Blog Fashion & Lifestyle Blogger. Freelance Marketing / Social Media Consultant. Facebook fans 823. Twitter followers 17,507. Miami, FLA About Blog The essential guide to cycling in sunny miami, covering local cycling news, events, group rides, bicycle culture, and more. Facebook fans 11,982. Twitter followers 7,535. Surfside, FL About Blog Miami’s uptown beachtown. Located in Miami, Surfside is a beautiful oceanfront community that offers a pristine beach, luxury beachfront hotels, world-class shopping, and culturally diverse restaurants. Facebook fans 1,756. Twitter followers 218. Miami, Florida About Blog A Sparkle Factor is a fashion, beauty and lifestyle blog curated by Stephanie Pernas, focused on highlighting attainable style for the everygirl. Facebook fans 690. Twitter followers 2,579. Miami About Blog The Fashionista's Diary is a fashion and lifestyle blog based out of Miami focusing on affordable, on-trend fashion mixed with high-end items. Facebook fans 2,806. Twitter followers 1,494. Miami About Blog Miami Fashion & Travel blogger mixing high end with high street. Outfits of the Day, fashion and styling tips. Facebook fans 1,498. Twitter followers 770. Miami, FL About Blog A Miami-based fashion, beauty & travel blog that inspires women to dress & feel better about themselves no matter the price tag, age, lifestyle or even personal circumstances. Facebook fans 10,791. Twitter followers 626. South Florida About Blog Hi! I’m Rachelle, based in South Florida, PinkSole highlights my style for both work and play on a budget with some splurge worthy investment pieces. I love stripes, lace, denim, a nice cross-body bag and shoes. Facebook fans 2,235. Twitter followers 2,273. Miami, FL About Blog Fancy Things serves as a source of inspiration and covers everything from Fashion, Beauty, Home & Travel. Facebook fans 5,786. Twitter followers 5,712. Miami, FL About Blog Food worth the calories (WTC), stylish fashion with flair, and world-class culture in Miami, welcome to my blog. Facebook fans 944. Twitter followers 2,605. Miami, Fl About Blog A Fancy Affair blog is your source for fashion, beauty, lifestyle and travel written in English and Portuguese. I have a passion to inform others about popular trends, styles, tips and tricks! I love to empower women to look and feel their best at all stages in life. Facebook fans 1,888. Twitter followers 3,653. Miami, FL About Blog Miami Food Pug is a Miami food blog that combines local South Florida fare and cute pugs. Facebook fans 3,613. Twitter followers 2,356. About Blog We share our love of Miami here - providing you with insider tips and everything you need for your Miami trip. Facebook fans 49,362. Twitter followers n/a. Miami, FL About Blog You’ll find everything here. I’m a Wynwood advocate, huge foodie, and perpetual weekend traveler. I hope you enjoy everything you read! Facebook fans 7,064. Twitter followers 7,952. Miami, Florida About Blog Sky Five Properties is the real estate authority for Miami and the entire South Florida area. Our team provides a full range of consulting services that are unmatched in today's marketplace. Facebook fans 4,544. Twitter followers 171. Oxford, OH About Blog Everything you need to know about Miami University's award winning dining services. From sushi to pizza to specialty coffee drinks, we have it all! Facebook fans 2,668. Twitter followers 2,210. Miami About Blog Revealing analysis of national trends and local news you won't find in Miami's mainstream media. Dedicated to ethical government, saving tax dollars and a healthy environment. We aim to break the chokehold of Miami's developers and lobbyists on local government and the public commons. Miami, Florida About Blog Miami-based kkwt & Pratt, P.A. is a top Florida law firm with an international reputation for aggressive advocacy and exceptional civil litigation successes. The kkwt & Pratt P.A. blog shares Immigration & Naturalization Law stories and opinions relevant to Miami, Florida residents. Facebook fans 224. Twitter followers 258. Miami About Blog Miami Lifestyle Blogger at Brickellista Files. Your best friend in Miami. Helping you rock your work, wardrobe, and weekend, like a tropical ninja. Facebook fans n/a. Twitter followers 3,821. Miami, Florida About Blog New Miami Blog is published by Bilzin Sumberg Law Firm and focuses on the intersection of Miami's expanding global significance and commercial law. Facebook fans 418. Twitter followers 1,260. Facebook fans 1,507. Twitter followers 80. Miami Beach About Blog Miami Fashion Blogger, Ginger Harris, is Electric Blogarella, contributing her perspectives on life, art, fashion, style, events, beauty and health. Facebook fans 1,257. Twitter followers 5,988. Facebook fans 346. Twitter followers 822. Miami Beach, Florida About Blog A blog full of fashion, food, travel, art and life! Written by Miami based fashion blogger, Martha Dominguez. Facebook fans 1,666. Twitter followers 3,133. Miami, FL About Blog A Miami Fashion & Lifestyle Blog. Fashion, Style, Beauty, Decor, Celebrity Style, Personal Style.While viewing my daily posts, you will find beauty inspirations, styling tips, up & coming seasonal must-haves and of course, some personal touches and obsessions. Facebook fans 2,497. Twitter followers 711. Miami, FL About Blog A modern woman's musings on fashion, beauty, travel, and the pursuit of style. Kelly Saks is a personal stylist and fashion blogger based in Miami. Facebook fans 2,818. Twitter followers 6,478. Miami About Blog We are a Miami Lifestyle Blog and Affiliate Marketing machine. We Share and Create Media for Local Businesses, Restaurants, Events and more. Facebook fans 2,250. Twitter followers 18,934. Miami, Fl About Blog A blog about fashion, latest trends, reviews, and much more. This blog is written in English and Spanish, gathering all latest trend in fashion, beauty, and lifestyle. Facebook fans 2,332. Twitter followers 802. Miami, FL About Blog NAI MIAMI satisfies an age old problem, providing knowledge, expertise and guidance to its clients. The company is staffed by a cycle tested group of real estate professionals whose experience focuses on the analysis and review of complex real estate transactions. Facebook fans 304. Twitter followers 1,778. Miami / Fort Lauderdale About Blog Shireen Sandoval is an Entertainment Host, Film Critic and fashion blogger based in Miami, Florida. Enjoy all of her favorite fashion and South Florida things! Facebook fans 2,559. Twitter followers 9,238. Miami, Florida About Blog At Pacheco Perez P.A., located in Miami, Florida, we focus our practice primarily on family law. We handle a wide range of family law and divorce-related issues, including child support, timesharing, distribution of assets and liabilities, and domestic violence. Facebook fans 460. Twitter followers 33. Coral Gables, FL About Blog The best things to do, eat, and shop in and around Coral Gables. Discover your city. Facebook fans 933. Twitter followers 1,431. Facebook fans 1,043. Twitter followers 417. United States About Blog The fashion blogger of rubber shoes helps you dress for your best occasions and even in your life will say both rubber shoes and heels. Facebook fans 1,013. Twitter followers 288. Miami Beach About Blog Founded in 2015 by Miami native, Jenny Farias, Goodtella is a multi-media blog that’s re-imagining the world of food blogging. By infusing a bit of ‘hot sauce’ and ‘wit’ to its content & imagery, Goodtella offers readers the latest on what’s trending in Miami. Facebook fans 883. Twitter followers 412. Miami About Blog Laura B. is a Miami fashion blogger and beauty obsessive. She loves all things with glitter and or sequins, impractical shoes, large handbags and a good sale. She blogs about anything beauty and fashion related she feels women should know about. Facebook fans 721. Twitter followers 763. Miami Beach About Blog Condoideas Realty Group specializes in second homes in Miami Beach and Downtown Miami. We cater to an international clientele since our agents speak English, Italian, French and German. Facebook fans 4,507. Twitter followers 149. Miami, FL About Blog I'm going to share some of my lifestyle, my choices and things that I love, like: fashion, food, beauty, health, travel, home, design, decor, events, business, opinion, trends and daydreams ! Because style and elegance are part of the DNA of any woman. Facebook fans 1,842. Twitter followers 1,695. Miami Beach About Blog A Miami fashion, food and lifestyle blog where Miami enthusiasts can revel in and be thankful for life in paradise. Your resource to everything Miami. Facebook fans 793. Twitter followers 2,620. Miami About Blog One of Miami's top, premiere fashion blogging websites about fashion, beauty, and Miami events. Facebook fans 856. Twitter followers 1,581. Miami, FL About Blog Russell A. Spatz. Esq. is an experienced Trial Lawyer in South Florida and has been practicing as a Miami Criminal Attorney for over 35 years. He truly cares about his clients, and strives to help them not only resolve their legal problem, but also to help them find a better place in life. Facebook fans 1,036. Twitter followers 1,449. Miami, FL About Blog MiMi's Lifestyle Blog – Lifestyle, Events & Entertainment. Lifestyle Vlogger/Social Media Influencer. Facebook fans n/a. Twitter followers 1,722. Miami About Blog Iron N Salt is a fashion and lifestyle blog curated by two best friends Daniela Moreno and Valentina Hernandez. Follow us for outfit inspiration, travel, beauty and more! Facebook fans 423. Twitter followers 529. New York - Miami About Blog A lifestyle blog representing elegance and luxury. High heels, high goals, high grace. Facebook fans 270. Twitter followers 327. Sunny Isles Beach, FL About Blog I am a Residential & Commercial Realtor® residing in Miami Beach & specializing in Off Market Residential & Commercial Real Estate. Facebook fans 197. Twitter followers 510. 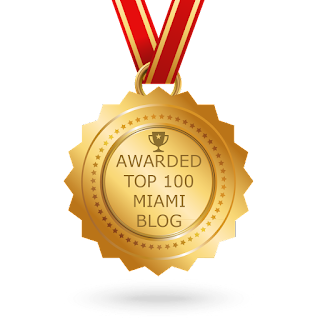 CONGRATULATIONS to every blogger that has made this Top Miami Blogs list! This is the most comprehensive list of best Miami blogs on the internet and I’m honoured to have you as part of this! I personally give you a high-five and want to thank you for your contribution to this world.